Click to view/print PDF Flyer. WHAT CAN YOU EXPECT FROM THE CAMP? All players will be placed in groups according to position. All players will work in small groups with a varsity coach at that specific position. Individual and group instruction on both offensive and defensive fundamentals and strategies. Each practice will be broken into individual position time, pass game, run game, and team time. Each player will experience position specific drills and team play situations. Each player will be trained to be a better, more confident football player! You will go home a Trojan! Camp will begin at 5:00 pm and finish at 7:30 pm. Parents are encouraged to attend and watch camp as their players work with high school coaches and players. All players who are currently in grades K-3 are eligible to attend. 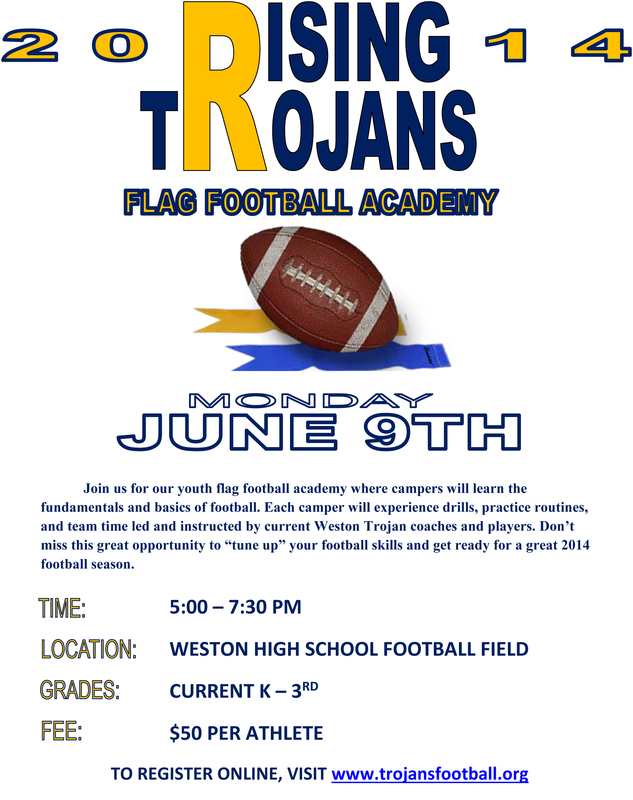 The RTFA also welcomes new players to camp who have not played the game of football before to learn and develop the fundamentals and skills of the game. The academy will be a NON-CONTACT environment. Players should wear t-shirts, shorts and cleats in order to be fully prepared to participate each day.